Mystery Man On Film is sponsoring a screenwriting blog-a-thon this weekend. Here’s my contribution. It’s about the script for Pirates of the Caribbean: Curse of the Black Pearl, by Terry Rossio and Ted Elliott. Spoilers ahead, says I! Ye be warned. Captain Jack Sparrow may be by far the most entertaining character in Curse of the Black Pearl, but I’m barely going to mention him, because it’s really Elizabeth Swann’s story. Though at one point Jack Sparrow tells Will Turner, “Pirate is in your blood, so you’ll have to square with that someday,” that remark is more properly directed at Elizabeth; it’s the main character arc in the script. It is widely believed that in the best screenplays, character drives plot, and plot defines character. In Curse of the Black Pearl hardly a single thing happens that cannot be traced directly back to the core motivation of one or more of the characters; and the events of the film result in the conflicted Elizabeth finally turning her back on the respectable life offered by Norrington and her father, and embracing piracy. Let’s take an example of how character drives plot in this script. What brings the Black Pearl to Port Royal? The medallion falling into the water (and thus “calling” to the cursed pirates by magic). Why does it fall into the water? Because Elizabeth was wearing it when she fell into the water. Why was Elizabeth wearing it? Because she put it on after her dream of the day she rescued Will Turner. Why did she put it on? Because of her secret fascination with pirates. If it was secret, why did she wear it out of the house? She wouldn’t have, except that she didn’t have time to remove it and hide it when her father barged in with the dress (see below). Why did Elizabeth fall into the water? Because she was wearing a dress that fit so tightly, she couldn’t breathe and passed out. Why was she wearing such a dress? Because her father gave it to her. Why did he give her such a tight-fitting dress? Because he wanted her to look especially beautiful at Norrington’s promotion ceremony. Why? Because he expected Norrington to propose marriage to her and he wants his daughter to marry well. Elizabeth has a fascination with pirates. Will needs to prove himself to Elizabeth. Swann wants his daughter to marry well. Barbossa longs to experience sensual pleasures again. Here’s another example. How did Elizabeth wind up dining with Captain Barbossa in his cabin? Because she was taken prisoner, and because Barbossa wanted to watch her eat. Why was she taken prisoner? Because she had the medallion, knew to ask for parlay, and claimed her name was Turner (leading the pirates to believe her blood could lift their curse). Why did she have the medallion? Because she took it from Will the day she rescued him at sea. Why did she take it? Because she feared what the crew would do if they suspected he was a pirate. Why did she fear that? Because Norrington expressed his hatred of pirates to her. Why did he? Because Elizabeth expressed her fascination with pirates. How did she know to ask for parlay? Because of her fascination with pirates. Why did she claim her name was Turner? 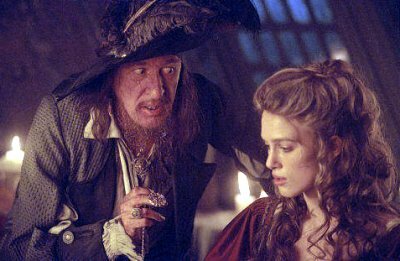 Why did Barbossa want to watch Elizabeth eat? Because of his desire to experience sensual pleasures again. Of course, Jack Sparrow is the epitome of single-minded motivation. Although his behavior throughout the film appears erratic, with his loyalties shifting from moment to moment, in fact a great deal of the movie’s delight is the gradual revelation that he’s cunningly been in complicated but unwavering pursuit all along of his one goal: to avenge himself upon Barbossa and retake the Black Pearl. From this perspective there is just one flaw in the construction of the story. After the first attempt to lift the curse fails and Will helps Elizabeth escape the cave, she grabs the medallion before fleeing. Why does she? She knows it’s what the pirates are after. By taking it she ensures the pirates would continue to pursue her. By leaving it, she’d be free of them. Though I am in awe of the plot construction of Curse of the Black Pearl, I still have room for admiring other aspects of the script; for instance, avoiding the trap of writing Norrington as a cad or a villain. How many hundreds of times have we seen the cliché of the father intent on marrying his daughter off to some successful jerk? That Norrington is instead smart, brave, handsome, and accomplished — in Elizabeth’s own words, “what any woman should dream of marrying” — is not only a refreshing change but a way to make Elizabeth’s conflict (between her respectable life and the lure of piracy) more vivid. I appreciated too the symbolism of the dresses that Elizabeth receives. Elizabeth finds the life offered by the likes of Norrington and her father to be stifling, and this becomes literally true when she puts on the constricting dress of virginal white from her father (who thus wraps her like a gift to Norrington) and nearly suffocates. On the other hand, the blood-red dress given to her by Barbossa, a pirate, suits her to a T — because she’s a pirate at heart. Elizabeth: Will! It’s so good to see you. I had a dream about you last night. Will is Elizabeth’s fantasy lifeline to the world of pirates. Governor Swann: Yes, well, is that entirely proper for you to…? Swann is concerned above all with respectability. Elizabeth: About the day we met, do you remember? Will: How could I forget, Miss Swann? They have remained friendly all these years, but Will knows his station. Governor Swann: There. See? At least the boy has a sense of propriety. Now, we really must be going. There you are. Elizabeth: Good day, Mr. Turner. Will: Good day… [as Elizabeth’s carriage rolls out of earshot] …Elizabeth. He savors the sound of her name. He is in love with her from afar. If only he could prove himself to Elizabeth (which explains why he later challenges Jack Sparrow — after Sparrow threatens Elizabeth). Of course the script is positively littered with lines that are novel, inventive, playful, quotable (irresistibly so to an old movie-quote maven like myself), and — best of all — perfectly in character and in the service of the story. Finally, the dense weave of the script is cleverly tightened just a bit more by having some fragments of dialogue — the “guidelines” quote above, the word “leverage,” and the phrase “the opportune moment” — recur multiple times in different contexts, fraught with meaning each time.